Click here to add a personal tribute to horses that are sadly no longer with us. 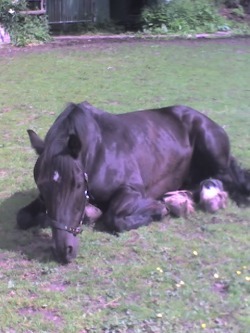 Merlin was a 14.2 black welsh cob. He was given to us along with Minstrel as they had been kept in their owners' back garden and as they were moving house they could no longer keep them. When we first had merlin he was a very difficult horse and the people who had previously tried to rehome him had returned him after a day after a serious disagreement describing him as dangerous. He was extremely difficult to handle, very awquard to pick out his feet, very impatient and he did both kick and bite. As a COPD sufferer and also having sweet itch his health problems also made life difficult as he was reluctant to leave his stable in the summer as he didn't want to be bitten by the flies but staying in made his breathing worse. After steady and firm handling merlin developed into an amazing schoolmaster and almost always came clear in jumping and loved to go to shows. He was a real confidence giver and helped so many people get their first rosette. He did become better to handle and the kicking and biting became less of a prolem and he even learned to stand still! Merlin died very unexpectedly as he was found in the field lying on his side with no signs that he had struggled and no indication of how he had died. He will be sadly missed by a lot of people. We are proud to have known him and glad to have been able to have given him a second chance but we wish we could have had the pleasure of his company for a lot longer. 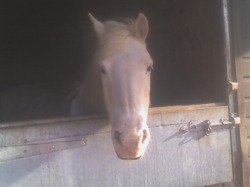 Tuppence was a grey 13.3 mare. She was given to us on permanant loan. Her owner was going to university and so was no longer able to look after her. In the meantime she was living on a farm with some sheep. Tuppence was a good school mistress and taught many of our riders to ride. She could always be relied upon to look after nervous riders and was always steady. She had a good retirement of over four years as we were unable to keep weight on her due to teeth problems (she has loads missing). During her retirement she lived with two friends' horses, one of which was also retired and enjoyed the occasional hack out by a friends granddaughter. Tuppence would always lift up a hoof to say please when offered a treat. Tuppence was put down due to problems with her weight as it was decided that she was unlikely to live through the winter as she was unable to keep weight on even with the summer grass. She is sadly missed by many. 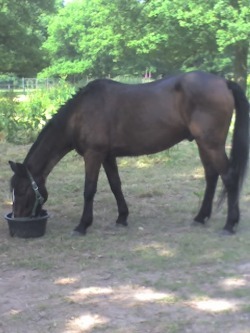 Snip was a a 14.1 bay gelding and retired polo pony. He was given to us on permenant loan by a friend. With mild COPD, very bad sweet itch and cataracts he was a difficult pony to look after. Snip was very shy because of his poor sight and so he was very hard to catch even with a bucket of food. It took a very long time to be able to stroke him over the stable door as he would always shrink back afraid to be touched. When caught he was very gentle to handle and perfect for people who were nervous of horses as he was so uncomplicated. He loved to be in his stable away from the flies. When in the field he was devoted to Belle and would follow her everywhere. He was a steady ride and although he was limited because of his health problems he brought people on a lot and gave them confidence, particularly because he had very smooth paces which made him very easy for beginners to ride. When riding snip he was so relaxed his ears would waggle and when standing waiting his lip would droop giving him a dreamy expression. Snip was put down because he was very thin and the previous winter had lost interest in his food and had struggled to keep the weight on. He enjoyed a very lazy summer of semi retirement and it was decided that it was best for him to be put down before the winter as he would have struggled so much. He is fondly remembered by many at the stables.